Never played Vagrant Story? Here's your chance to make up for it. 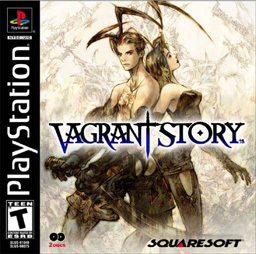 Vagrant Story, like Xenogears, is one of those weird games - released on the PS1 in 2000 to critical acclaim, it apparently sold well enough to be included in Sony's "Greatest Hits" collection. Yet it always seems like nobody you know ever played it. If you're one of those people who've never played the Ivalice side-story, Square-Enix and Sony are giving you a second chance. Vagrant Story will be hitting the NA PlayStation Network this week (tomorrow, to be precise) for $5.99 - and as with all PSone Classics, it will be playable on both PS3 and PSP. Vagrant Story is a game of many genres - it's part puzzler, it's part RPG-with-timing-based-combat, and part platformer - that follows protagonist Ashley Riot, a medieval secret agent who has the most ridiculous hair ever seen in a Square-Enix game (no small feat). Ashley is blamed for murdering a noble and must work out the truth behind the crime as well as dealing with the typical conspiracies one can expect to find in a PS1-era JRPG. It was commended for its very in-depth crafting system and plot, but some critics lambasted it for a combat system that was difficult for many players to grasp. Either way, it's frequently cited as one of the brightest stars of Square-Enix's classic lineup, and it can now be yours for $6 if you live in North America. If you live in Japan or Europe, you've already had it for sale since 2009, so you're probably wondering what all the fuss is about.